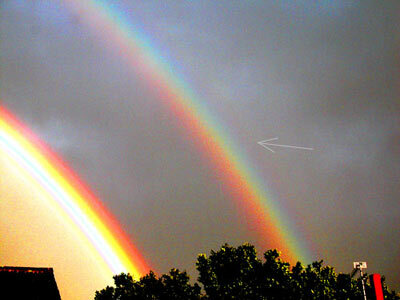 Secondary rainbows have very faint and broad supernumeraries outside the main bow. 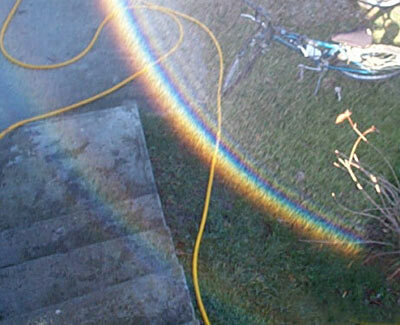 Rainbows from garden hosepipe sprays often show them. In the image look to the left and below the blue of the secondary bow to see its faint supernumerary. Hosepipe sprays produce clear supernumeraries because their droplets have very similar diameters. Michael Ellestad (site) made this hosepipe bow. Image ©Michael Ellestad. A secondary supernumerary is just visible in this much enhanced image. The primary's colours are grossly distorted by the contrast increase. The two bows were not particularly bright but the supernumerary was faintly visible to the unaided eye.